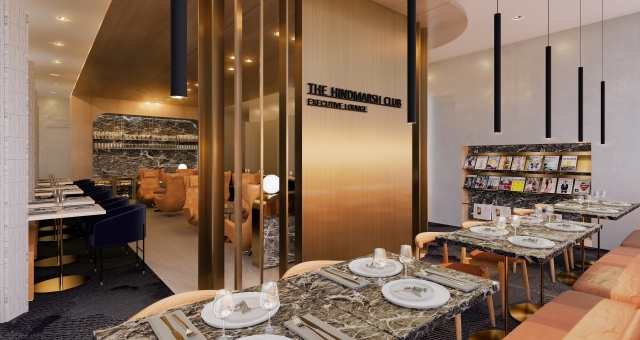 The first major milestone in the transformation of the Pullman Adelaide will soon be unveiled in the form of The Hindmarsh Club, an exclusive lobby lounge to open by the end of the year. Crafted by design firm Woods Bagot, the lounge will offer a tranquil haven in which business travellers can catch up on work after check-out time or relax with a selection of magazines or newspapers. For those opting to work, a number of private work stations will be on offer, equipped with the latest technology. A meeting room on-site is also available to book. The hotel’s surroundings including Hindmarsh Square and the Botanic Gardens will make up much of the inspiration behind the design, with city architecture and cultural elements also harnessed. Brass, Adelaide marble, honed travertine and oak will comprise much of the overall design. “We are incredibly excited to now be embarking on this new project with our hotel owner, Hines Property and we are looking forward to welcoming guests into an executive lounge that will rival any across Australia’s hotel landscape when it opens later this year,” said Llewellyn Wyeth, General Manager for Pullman Adelaide.